PC member Fathi Majbri reveals the details of the much delayed 2018 budget. Presidency Council member for the east, Fathi Al-Majbri, revealed the details of the 2018 budget at a press conference in Tripoli yesterday. The news on the agreement on the much delayed 2018 budget was first revealed by the Central Bank of Libya on Wednesday. Majbri said that the budget deficit for 2018 is 23 percent, down 5 percent from the 28 percent budget deficit of 2017. Majbri revealed that out of the LD 4.7 bn projects and development budget, the National Oil Corporation will receive LD 2.2 bn. He said that the NOC was given special attention in the budget as it was the main financer of the 2018 budget. It will be noted that there is a LD 5 bn increase in the 2018 budget compared to the 2017 budget. There has been an LD 3.8 bn increase in state-sector salaries, the largest sector increase, but with increases in all the other three sections of the budget too. On the sources of revenue for the 2018 budget, Majbri said 64 percent was from oil revenues, 12 percent from other state revenues and 23 percent was a loan from CBL reserves. Majbri made much of the fact that the budget was a Libyan-Libyan achievement without the intermediary intervention of external powers. This may explain why it took so long for the budget to be agreed – even by Libyan standards. 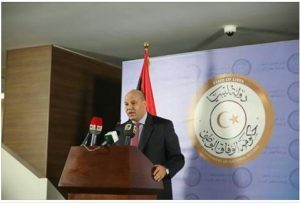 Last year, the 2017 budget was finally agreed upon at the end of December 2016 after reconciliation meetings in London, Rome and Tunis between the Faiez Serraj-led Presidency Council, the Central Bank of Libya, the National Oil Corporation, the Audit Bureau and foreign states supportive of the Libyan Political Agreement (LPA). Majbri said that the differences over the budget were mainly over ‘‘priorities’’ and not over ‘‘the national Libyan interest’’. He thanked all the Libyan entities for their cooperation, including, surprisingly, the eastern-based Interim Government of Abdullah Thinni as well as the Libyan National Army (LNA). With regards to the LNA, Majbri thanked them for providing access to Libya’s oil in the eastern oilfields – to all Libyans. This fact, he stressed, puts pressure on Libyans to ensure that the oil money is spent on all Libyans and without any corruption. Furthermore, he hope that the accord and reconciliation that was achieved by the opposing political sides over the budget could auger the possibility of ending Libya’s political split. The Presidency Council refers to the budget as the ‘‘Financial Arrangements’’ as it is a de facto budget agreed and implemented by the Tripoli-based authorities, but not approved by the Tobruk-based House of Representatives (HoR) – the internationally recognized Libyan legislature. Under existing Libyan law, only the legislature – the HoR – can approve a budget. The HoR has made no official comment on the 2018 budget. Nevertheless, it will be recalled that the 2017 budget was rejected by the House of Representatives and was labelled as ‘‘unconstitutional’’.